District Court of Bishkek concluded its consideration of the criminal case against Aida Salyanova, ex-minister of justice, former prosecutor general of the country and member of the Jogorku Kenesh (Parliament of Kyrgyzstan). The court sentenced Salyanova to five years' imprisonment suspending the sentence to 12 years, reports the 24.kg news agency. According to the investigation, in 2010 Aida Salyanova, being the head of the Ministry of Justice abused her official position by illegally renewing a license to lawyer Alexei Eliseev. Speaking earlier at the trial, Salyanova stated that "according to the law, there were no violations in the extension of Eliseev's license. On the contrary, if at that time we did not extend the term of Eliseev's license, we would violate the law." The court found her guilt fully proven and determined the punishment in the form of five years of imprisonment with confiscation of property. But since she has a small child, the execution of the sentence was postponed until the moment when her daughter turns fourteen. Now the child is two years old, writes 24.kg news agency. After the verdict announcement, supporters of Aida Salyanova and her relatives shouted to the judge: "Damn you!" The convict earlier noted that she was ready for a sentence, since both the investigation and the court initially committed violations, and the case against her is a political order. 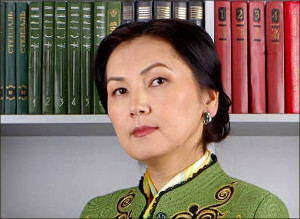 Aida Salyanova is known for her opposition to the policy of the current president Almazbek Atambayev. She was categorically against holding a referendum on amending the country's constitution, stating that "there are no legal grounds for this."